Nail art can get quite intricate and detailed, as it is often defined by small patterns and designs that a person has to paint on their nails. 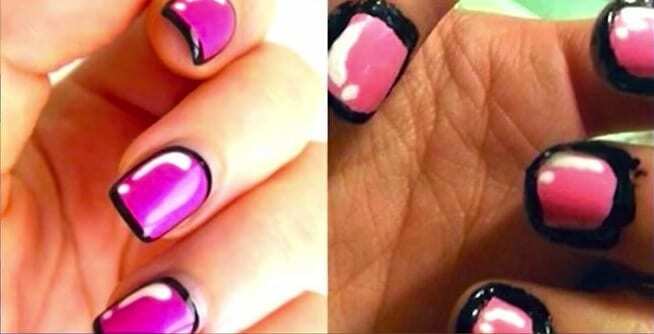 Because of this, nail art enthusiasts are bound to make mistakes as they try and perfect their artistic techniques, which many times end up being pretty funny. 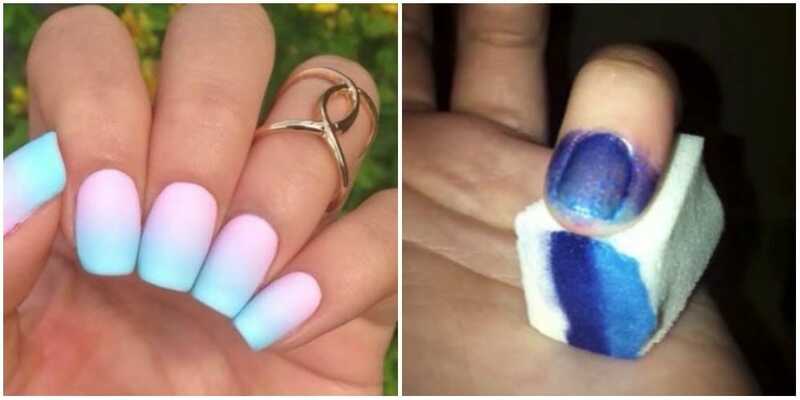 We have compiled a list of some of the best “nail art fails” where people couldn’t quite accomplish the goal they were attempting to achieve. Gradient nail art uses two complimentary colors that combine to make an ombre effect on the nails so it looks like one color fades into the next. This technique is achieved using a sponge to place the polish on. This person attempted to use the same technique, however, they missed the mark by using two shades of blue that were just too similar. It also looks like more nail polish landed on their skin than on their fingernails. Who doesn’t love getting all patriotic when the Fourth of July rolls around? It’s a great opportunity to get out your red, white and blue – including for your nails! This patriotic American just wanted to have some American flag-inspired nails, but it looks like she missed the boat by a mile. This pattern no doubt takes a steady hand to complete successfully, so we’re thinking next time, just ask a friend for some help! Plaid is a popular trend in fashion and a the favorite pattern worn by lumberjacks. As with all fashion trends, plaid eventually made its way onto the nails of trend setters, with the pattern popping up all over the place. To achieve the look, you need to cut a bunch of pieces of tape and line them up on your nails. This person clearly tried to use the tape method but it ended up being a big ol’ orange mess. There is a big trend amongst millennials to make all things look like a marble countertop. The pattern has been used on everything from phone cases to notebooks and now nails. Painting a nail to look like a slab of marble is no easy task but the person on the left got it right with the black veiny lines. The person on the right, however, seems to have tried to move the water marbling technique to get the same effect but alas, it was a big fail. Here is a nail design for people who want their fingers to be both beautiful and educational. The person on the left clearly took a long time to get this impeccable result and used a very complicated technique. The person on the right, however, tried but failed to get the same result. It looks like they just stamped newspaper ink onto their wet nails, which smudged the nail polish and gives an incredibly messy look. This person was so close to getting it right! The pink color they chose was perfectly applied and everything was going great until they attempted to paint a snowman on one of their nails. The lopsided face ended up looking more like a deformed baby penguin than a happy snowman with coal for eyes and a mouth. We suggest that this person just stick to painting regular colors since they’re pretty good at it. Houndstooth is a classic pattern, however, it is more commonly found on clothes than on nails. But that didn’t stop this person from giving the nail design a shot. While we don’t know what technique they used to get the pattern, it clearly didn’t work well. The black parts are all squished, which gives a really messy look and makes it more like there are black tips rather than a consciously attempted pattern. This design is pretty meta as a lot of nail designs are often posted on Instagram and there are even entire Instagram pages dedicated to nail art. The Instagram user on the right wanted to user the colors and pattern from the app on their ails using the gradient method. While the colors and the technique aren’t too off, the white cameras painted over them ruin the whole look. Funnily enough, they posted their failed attempt on Instagram, so at least they went full-circle. This look was inspired by the Star Wars movie, The Force Awakens and while we love the idea, the plan was not executed properly. If it were not for the colors they chose, we would not have been able to tell that these nails were supposed to resemble R2-D2. The lines are messy and uneven and it looks like they were drawn with a toothpick instead of a nail tool. The force is not strong with this one. Having textured nails is a trend that has gained popularity in recent years and one method that is used frequently is caviar beads. This is another one of those looks that only works when executed correctly and otherwise it just looks like you dunked your hand into a bucket of sprinkles. This person posted a photo of the results after using 3D pearls but with all of the gaps on the nails it looks like she really did use sprinkles. Drawing puzzle pieces on your nails is a tall task, which is why it is usually left to the pros to do. It requires a number of steps, a steady hand, and many tiny nail art tools to add in the little details. 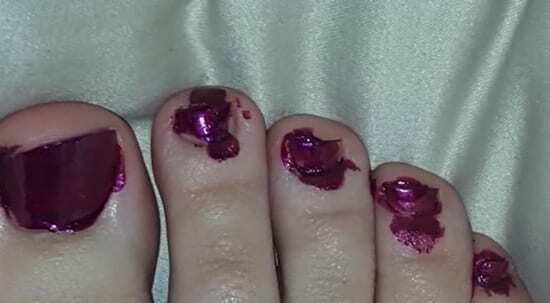 While we know that this person probably tried really hard to create this look, a shaky hand plus a lack of the proper nail tools left their nails looking like a smudgy mess. Galaxy pattern is all the rage these days and it can be found on almost everything from clothes to donuts. But to get someone to paint an entire galaxy on their nails is asking a lot, and it’s no wonder it didn’t quite turn out the way this person had hoped. To get a good result requires tons of expensive nail art equipment like sprays and brushes, let alone the time and precision it would take. Keep reaching for the sky, though, and maybe one day you’ll get there! We’ve talked about the stars and stripes but here is an even easier pattern that you might think would be easy to pull of. But think again! This attempt at a patriotic manicure leaves a lot to be desired. There is more paint on the skin that on the nails and the stripes are completely uneven and messy. Furthermore, on the nail that was supposed to be glitter looks like it was painted a weird green color. We have to give them props for the heart though, it’s pretty good. Like most of these nail designs, tri-color nail art requires the use of tape to separate sections on the nail. It can be a great way to show of your favorite color palette but if it isn’t done right, it ends up looking like you poured three bottles on nail polish on yourself. This person made a number of errors in an attempt to do a tri color nail. The sections are not correctly lined up and they didn’t let them dry fully. 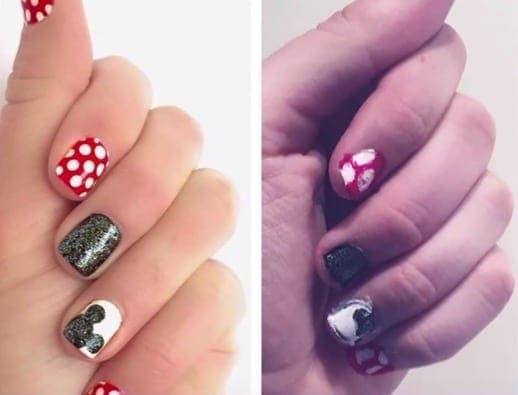 Of all the Disney characters you could choose to draw on your nails, you’d think that Mickey Mouse would be the easiest, right? Well think again because although one might think to use a dotting tool to simply paint on Mickey’s face and ears it is harder than it looks. 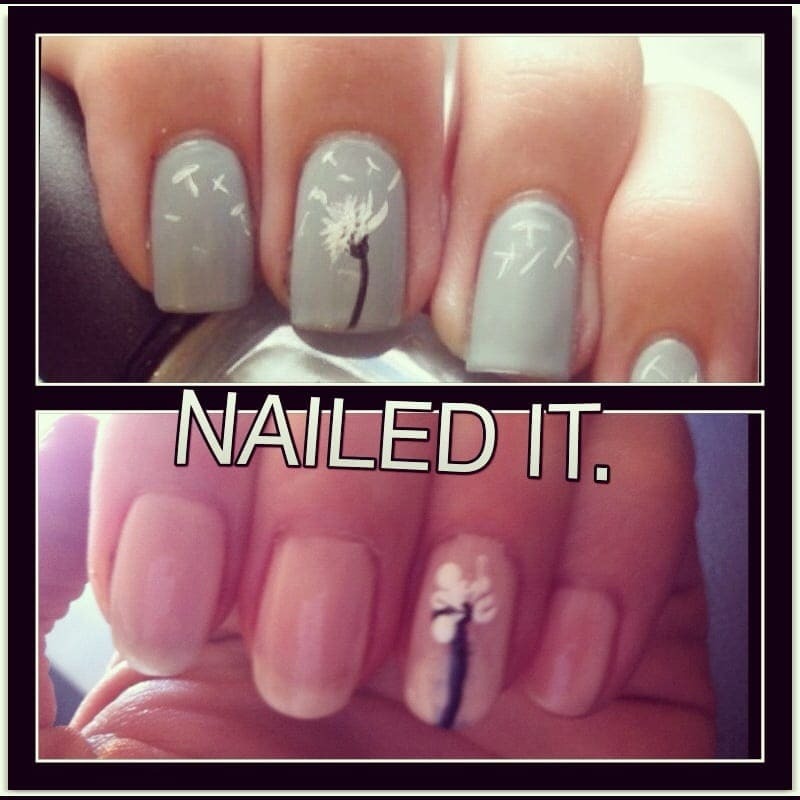 This person took some Instagram inspiration for their nail design, however, they were unable to copy the look. Everything is lopsided and squished and the polkadots are taking up half the nail. Out of all the complicated and challenging nail designs we have discussed so far polka dots have to be the easiest look to achieve, however, it seems than they might be harder to paint than we once thought. 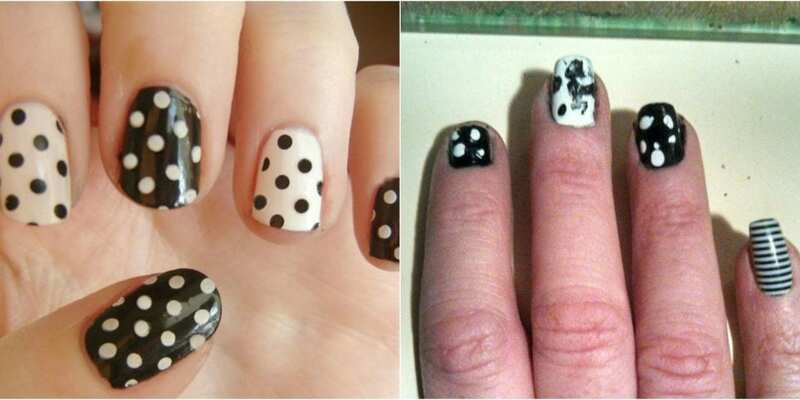 To be fair to this person, the pattern they attempted is a bit more complicated than a generic polka dot pattern since the dots are different sizes. But alas, the lack of symmetry and the wrong sizes of the dots made it into one giant mess. We’ve seen a lot of complicated patterns so far but these watermelon nails are actually pretty easy in comparison. All you have to do is paint a red base, paint one green line and one white line and throw a couple of black dots over the whole thing. However, it seems that is was still too difficult for this unlucky nail artist. Not only are their green lines misshapen, they got red polish all over their hands and painted the dots on way too big. Accent nails are a popular nails trend and one of the easiest ways for one to spice up their finger tips. 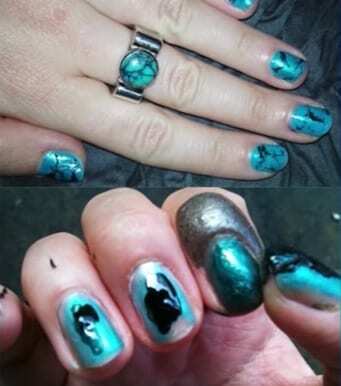 However, something simple for one person can be incredibly difficult for another as we can tell from this nail fail. We don’t even know where to begin. More polish ended up on their skin than on the nails and they only painted one sheer layer of glitter that doesn’t really add much of an accent at all. Candy corn is one of those candies that no one actually eats but for some reason, grocery stores keep selling it around Halloween time. 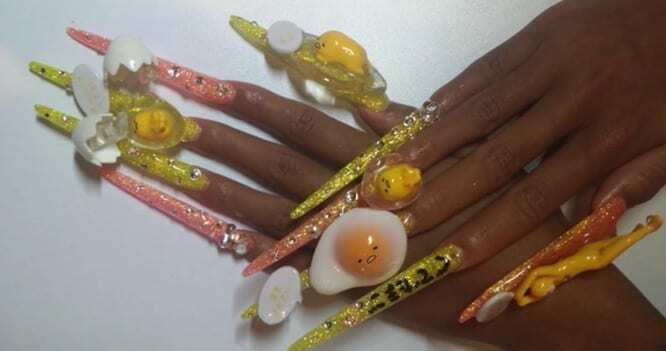 It has become a sort of staple of the spooky holiday, which is why this person thought it would be a great idea to pay homage to the snack on their nails. While you’d think that painting three stripes would be a simple enough task, this person really struggled with the whole tape thing. Some people just appreciate art so much that they go out of their way to put it on their body. This phenomenon has created a trend of nail art enthusiasts painting Vincent Van Gogh’s Starry Night on their nails. While the real life painting likely took the troubled artist a long time to create, it looks like it took this person all of five minutes to paint it on their nails. Their hand looks more like a Jackson Pollock rather than a Van Gogh. A French manicure is probably the most classic nail design that can be done by almost any nail salon. It gives one’s hands a clean and manicured look without being too out there. This person looks like they were trying to attempt some sort of upside down French manicure, however, they definitely won’t be starting a trend anytime soon. It just looks like they dabbed a bit of polish on the bottom of their nails and left the rest bare. Dots are probably the easiest pattern to paint on a nail. All you have to do is wait for your base coat to dry, take a nail tool and place little dots all over the nail and voila! The person on the right here just couldn’t get this technique right and the results ended up looking like they placed on the dots with a toothpick or and then purposely smushed their fingernails. What we can’t get over is how perfect the stripes are on their pinky nail! People seem to be absolutely obsessed with the minion characters from the Despicable Me movies. There is so much merchandise with minions on it and some are taking the obsession to the next level by painting them on their nails. While this person wanted to pay tribute to their favorite animated characters, they made a whole bunch of mistakes. Not only are the minions squished and misshapen but the yellow polish is streaky and messily applied. Splattering is a technique often used by artists on canvas but it has made its way to nail art. Splattering is a fun nail design but it can go wrong very easily. 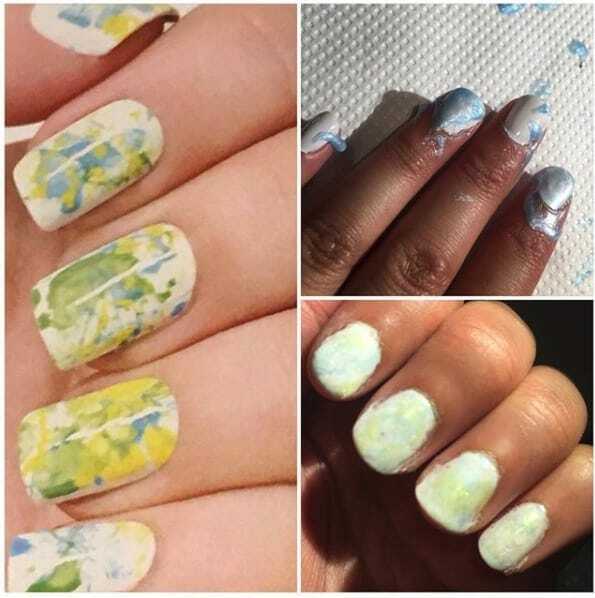 This person posted their failed attempted at splattering on Instagram comparing their results to the picture where they took inspiration from. They explained that they used a straw to blow the nail polish with, however, the technique clearly producer splotches and not splatters. This nail art fail was an attempt at an ice rink, however, in reality the designs look more like random buttons and lines. All of the lines are super uneven and messy and there is no hint about what they are supposed to resemble. The person on the left just used the colors of a hockey rink and painted a stick and puck so you can actually tell that they are hockey related nails. This person attempted to paint an Irish flag in honor of St. Patrick’s Day, however, it is hard to tell by looking at the colors if it is the Irish flag or the French flag. In addition, they used a Sharpie instead of nail polish which is why the colors are so watery and faded. 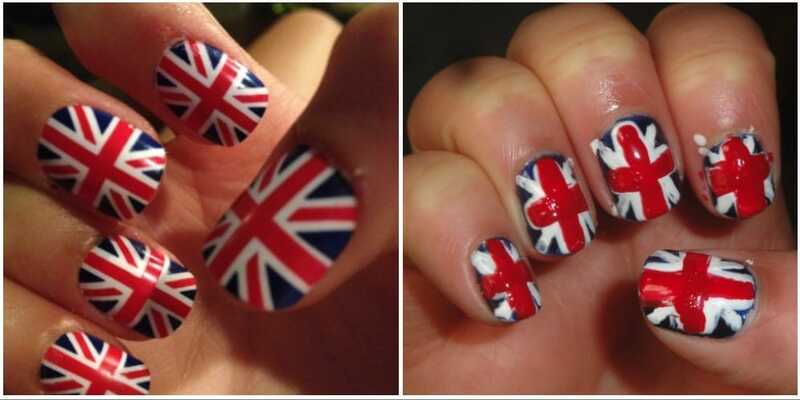 Next time they should just hold the flag instead of trying to put one on their nails. Duck feet nails are definitely a trend that has an acquired taste, as they look like something straight out of the ’90s. However, there are still people who love this style of nail and post pictures of the finished products online, and they can look nice when done with subtly. This example on the right, however, is anything but subtle. While they don’t seem to have failed at the intended design, the end result is so monstrous, it seems impossible this person would be able to get anything done. Furry nails made a recent debut into the nail art community and many went absolutely crazy for the idea of wearing fur somewhere other than just a vest or jacket. 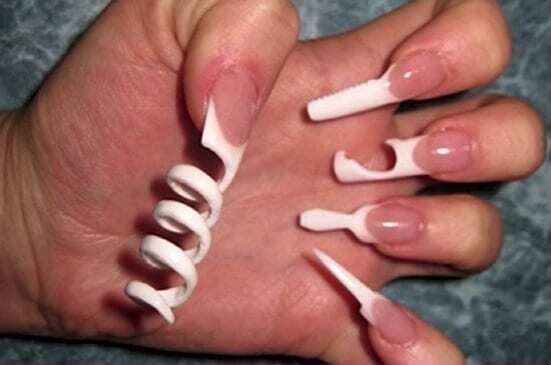 These nails may be trendy but they are neither practical nor, we feel, particularly attractive. Just think, how would you shower without ruining them? Or wash your hands? And could you imagine finding little hairs in your food if someone wearing these cooked you dinner? Yuck! These are better left for photoshoots and not for real life. These nails make a huge statement, to say the least. Besides the fact that were wondering if these are real or press-on (we’re assuming they can’t be physically possible to maintain), these nails seem like a disaster waiting to happen. This person probably wouldn’t be able to cook, shower or clean And we’re worried that they might poke their eye when sleeping. We wouldn’t want to be on the receiving end of a handshake from this hand. This image speaks for itself and what it is saying is, “go get a manicure!” Some nail designs are just better left to the pros and quilting is one of them. It is probably one of the hardest patterns to achieve as it takes a steady hand and a lot of patience. Trying to quilt the nails on your dominant hand with your non-dominant hand is a tough task, which is why we think that if you’re set on it, either practice or pay someone to do it for you. Hearts on nails are a incredibly fun and cute addition to any manicure especially when added into the mix with other designs like stripes and polka dots. However, when not done correctly, a heart an end up looking like a giant blob. This was the case for one person who simply placed a glob of nail polish on instead of outlining the shape of a heart. The results were obviously disastrous. Gudetama is a character from the Japanese company, Sanrio, which designs “kawaii” (meaning cute) and popular products in Japan. The character of Gudetama is an egg yolk that can often be seen lying down using a piece of bacon as a blanket. This nail art enthusiast apparently wanted to pay tribute to the character, with tiny eggs painted on their spikes for nails. However, unless they’re planning on not lifting a finger until the nails fall off, we suggest they get them removed. As of now you have probably realized that if you want to do an intricate design on a nail, you need a lot of space to work with. This is no different when it comes to drawing faces. 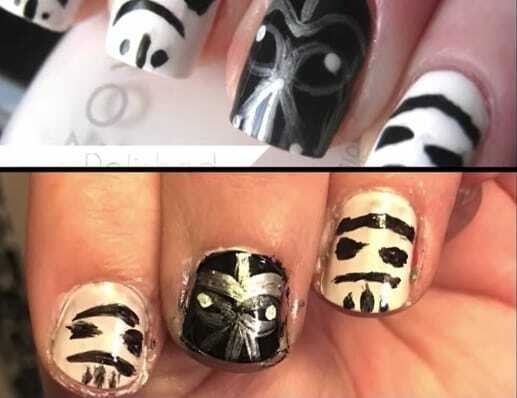 We give this Star Wars fan a lot of credit as we bet it took a lot of time and patience to create this look, however, it seems that they didn’t have the nail space or nail tools required in order to pull of such a complex design. 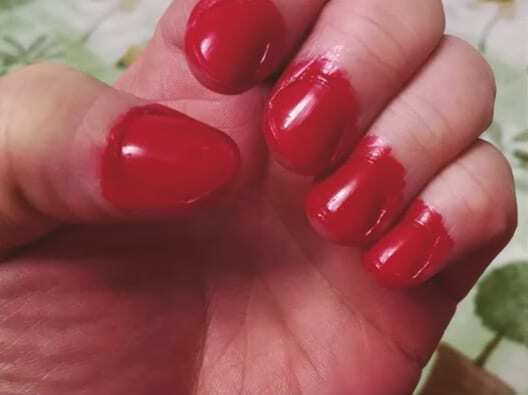 The sun never sets on the British Empire but we think the sun was down when this person attempted to paint their nails because it looks like they did it in the dark. The mail problem here is that they did not use a nail tool and instead used the actual brush from the nail polish bottle. Thus, they were left with big, messy lines. The white nail polish is taking so much space that you can’t even see the navy blue of the flag. 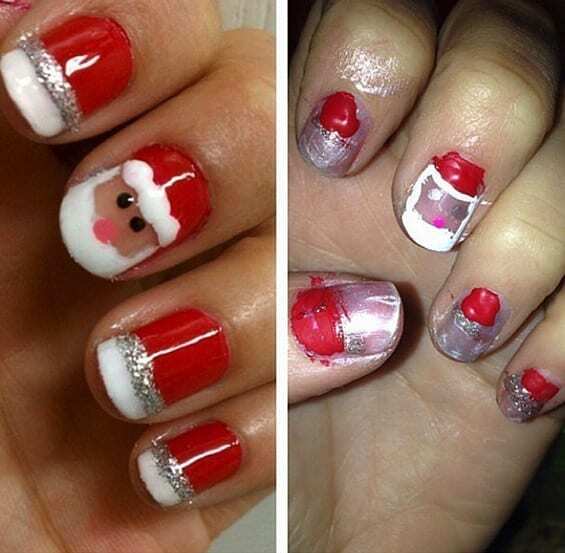 When getting in the Christmas spirit some people take the opportunity to dress up in festive clothing or even paint their nails to get in a jolly mood. 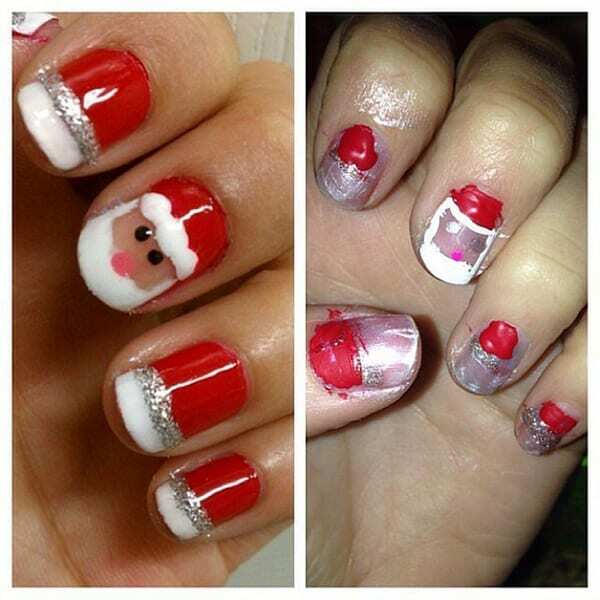 The person on the left here clearly spent a lot of time and effort to get these perfect Santa nails, however, we can’t say the same for the person on the right. While we have to give them some credit for trying, we wish they just put on a Christmas sweater instead. This dandelion look is very cute and creative as one nail portrays a little dandelion and the fluffs that come off of it are floating onto the other nails. It doesn’t look too difficult to create this look as it was done using small strokes of white nail polish. However, it seems that the person on the bottom was trying to paint some sort of cherry blossom but instead they got a messy looking tree. 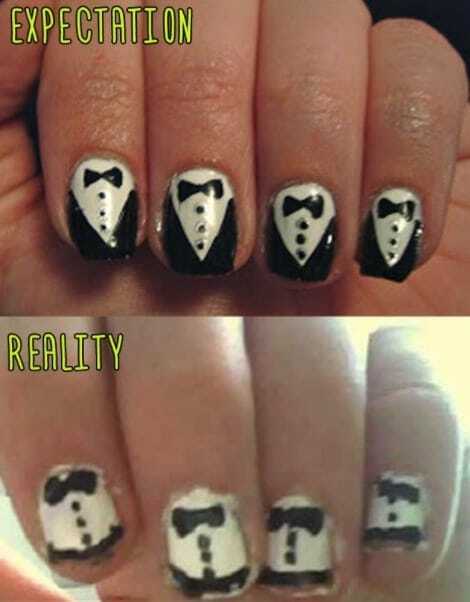 What better way to dress up a casual outfit than by painting tuxedos on your nails? Apparently there are a lot better ways since the results may turn out the way they did for this person in the bottom photo. This design requires the artist to make a v-shape with black polish along with three dots and a bow tie. But the person on the bottom only painted some lopsided bowties and some squiggly black tips. 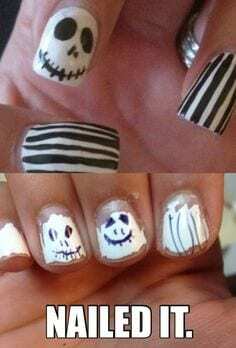 These Nightmare before Christmas nails have the added bonus of requiring an imperfect look since it is accurate for Jack Skellington’s eyes and mouth to be uneven. However, it looks like the person on the bottom took their artistic license to a whole new level with extremely chipped and crooked nails. They used a Sharpie and not nail polish in order to draw on the skeleton’s face. If they wanted to scare people with their nails, mission accomplished. While it sounds like something you would do with a stone, marbling is actually a technique that is used to achieve these swirly name designs. This challenging technique requires a bowl of water and many other tools, as well as a substantial amount of time. This method definitely require professional level abilities to ensure that most of the nail polish ends up on the actual nail as opposed to the skin. This person is going to need a lot of nail polish remover to clean up this mess. One of the reasons why doing nail art by yourself is so hard is because you paint to paint you dominant hand using your other hand. If you are right-handed, painting your left hand might be a piece of cake but the minute you switch over to the other side, all of the confidence you built up goes down the drain. This person didn’t do a bad job on the left side, but the right leaves a lot to be desired. It’s pretty cute when your significant other finds an interest in your hobbies (which is the case in this photo) but sometimes it can backfire. If you want a friend to help you paint your nails, you should seek one out who has the ability to hold a paint brush steady. The person who painted these toes clearly has no idea what they’re doing. If you’re going to have a nail painting slumber party, do your own toes! A quirky design on a nail can be the perfect way to express just how funny and ironic you are. However, it only works if you get it right and in order to do so, there is one major rule that can’t be ignored – let your nails dry! Even if you have to sit and wait around for an hour. It’s better than accidentally squishing your nail polish. This person ended up with smudgy and messy nails most likely because they didn’t dry properly, and because they used too big of a tool to paint on the mustaches. Here is another unfortunate example of a person who didn’t abide by the rule of waiting for your nails to dry. In addition to being a smudged mess, the chevron lines aren’t exactly even, which adds to the overall unattractiveness of this nail art. They also attempted to do an ombre nail but the gradient is way off and it just looks wrong. However, we can’t blame this person for not succeeding since a chevron pattern is a difficult feat to achieve when doing it yourself. We’ve all outlined drawings and learned how to color in the lines from the time we were kids. So you would think that being to outline a nail would be a relatively easy task. Not so. These outlines can often end up looking like waves and mess up an otherwise beautifully painted nail. We feel this attempt at an outline might have worked out better if the painter had used a smaller nail tool to get a more precise line. While no one could be expected to make perfectly straight lines, there has to be some standard to make these nails acceptable to wear in public. This lopsided, squiggly lines simply don’t cut it. Bubble nail art is supposed to be a cute and unique way for someone to express themselves with their nails. While it can look very intricate and detailed when done correctly, when mistakes are made it ends up looking the person has a skin disease. This person clearly put in a lot of effort to pull of the bubble nail look but it ended up looking like they fighting off some weird kind of growth. 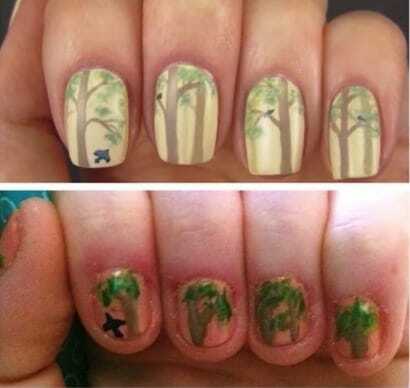 Drawing a nature scene on a nail is a lot to ask and it is no surprise that a beginner who attempted a complicated tree design on their nails didn’t get it right. First of all, a design like this requires a lot of space to work with and the person on he bottom has pretty small nails. Everything had to be a lot more squished, which means this person needed to use tools in order to get in every small detail. Turquoise looks great on a bracelet or a pair of earrings so lovers of turquoise got together and said “why not put it on our nails too?” And with that, nail art enthusiasts started painting their nails to get the same effect as a turquoise gemstone. When done right, dark veins are added through the nail to give it the same appearance as the stone but this person’s attempt was a major fail. We can understand that nail art is tricky even for the most seasoned pro and we don’t blame people for making mistakes. However, there aren’t too many rules when it comes to painting a basic color on a nail. All you have to do is paint in a straight line and try not to get any on your skin. And yet, this person found even this seemingly simple task impossible and it ended up looking like a small child did their manicure.